Fiat Linea is fitted with a safety switch that in the event of a crash comes into operation by cutting off fuel and turning off the engine as a consequence. Made between 2007 – present. This device therefore prevents fuel leaks due to fuel piping breaking. Important after the accident, remember to remove the electronic key from the ignition device to prevent draining the battery. The message “FPS on” will appear on the digital display when the switch trips. The message “Inertia switch tripped. See handbook” will appear on the multifunctional display. 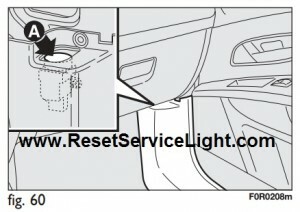 If, after a crash, you smell fuel or see leaks from the fuel system, do not reset the switch to avoid fine risk. Door unlocking in the event of a crash. If the fuel cut-off switch trips following an accident, the doors will be automatically unlocked to let you leave the car and the ceiling lights will be switched on at the same time. The doors can always be opened from the inside of the car by means of the specific levers. Proceed as follows if no fuel leakage is found and and the car is in condition to be driven to rearm the fuel cut-off switch. If the centralised door locking system was operated from inside the car and the fuel cutoff switch did not manage to automatically release the doors, it will not be possible to access the passenger compartment from the outside after an accident. The possibility of opening the doors from the outside depends on the conditions of the doors themselves after the accident: if may not be possible to open a damaged door. In this case, try to open the other doors of the car. Re-arming the fuel cut-off switch. Before resetting the fuel cutoff switch carefully inspect the car for fuel leaks. To reset the fuel cut-off switch, press button A-fig. 60.